From small lawns to acres of land, we mow lawns with the care and attention you can expect from Mow and Go. We always mow your lawn with sharp blades in our professional equipment to ensure we give a clean cut every time. The edges of your lawn can be strimmed or cut to your requirements and our expert landscapers will be happy to advise on lawn shaping and maintenance. What Large Lawn Mowing Services Do We Offer? We have a range of methods to remove weeds from your garden. We have a selection of treatments to keep your lawn in pristine condition. We will always clean up after ourselves when we’ve finished a job. Whether you need your lawn cut once, weekly or monthly we’ve got you covered. If you require any of these services call Nigel today on 07973 548049. We currently provide excellent lawn mowing services for a number of large and small residences in the Worcestershire area. We are happy to maintain your lawn even if you are away from home and can keep you updated via photos and videos to give you peace of mind. 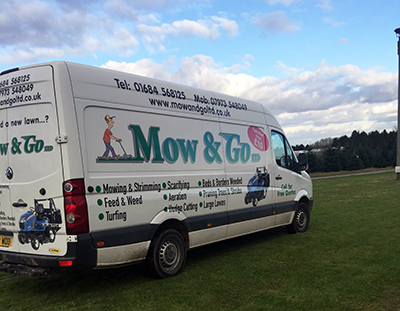 We provide contract lawn mowing services for business and retail parks, sports fields and other large scale grassed areas. Our professional team love keeping the grounds of care homes in tip-top condition. Large and small fields and paddocks can be all taken care of by our professional team. When you trust Mow & Go to maintain and improve your lawn, you are in safe hands. Our trustworthy and expert team of gardeners and landscapers have experience mowing large lawns. Nigel and the team have countless hours of experience in all aspects of lawn cutting and maintenance so you can be confident in their reliability and five star service. Do you need your large lawn mowing? The most important aspect of the job that we do for you is that there is 100% customer satisfaction. We are proud to provide a high-quality service at a competitive price. Don’t worry, we also mow small lawns. So don’t hesitate to get in contact.